Sierra Barnhart, left, competes against Jenna Justice, right, while Max Thomas and Sydney Krewson compete at the far table. Competitors has limited time to answer as many questions as accurately as they could. Friday was the Sweet Sixteen of the competition, and the final competitions will be held next week. Pictured is the bracket of the Math Madness competition taking place at Hayes last week and the upcoming next week. The classroom is silent as Hayes High School students hunch over a packet of questions with their eyes peeled on a timer on the smartboard. Math teacher Joshua Lamb gives the go ahead and the sophomores in the group flip the packets over and feverishly start answering. The timer on the board ticks down from 2 minutes and 30 seconds. The juniors in the competition glare at the board, willing the timer to hit 2 minutes. They flip their packets the literal second the timer reaches 2:00. The senior in the group has to wait until 1:30 and finally gets to start on his sheet. When the timer reaches triple zeros, the pencils go down and all the students take a big sigh of relief. 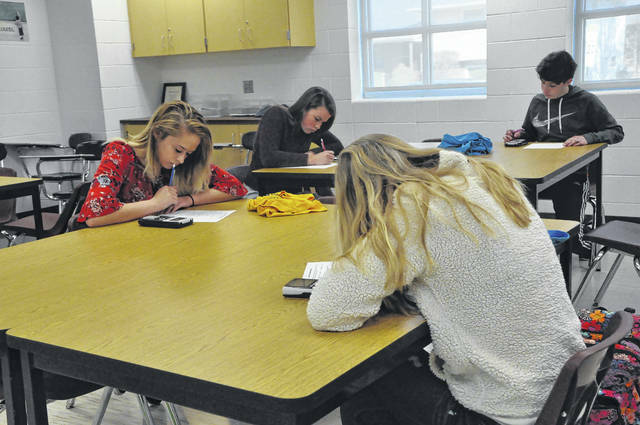 This was the scene at Hayes High School Friday morning during the “Math Madness” competition. Lamb said he got the idea a few years ago when he and a friend decided to do a math competition bracket during March Madness. Lamb said the competition consists of students from every house (Hayes students divided into eight different houses as part of the House Program initiative) completing as many math questions as quickly as possible. However, the number of questions isn’t the deciding factor, accuracy is; meaning a student who answered seven out of eight right would lose the round to a student who only answered one, but answered it correctly. Lamb said freshman get 3 minutes and said every higher grade gets 30 seconds less, meaning seniors get a minute and a half. Lamb said the competition is all about risk versus reward. Do you try and beat an opponent’s score with raw numbers or focus your attention on a few questions and lock down 100 percent accuracy. Lamb said many of the participants didn’t describe themselves as competitive until they were put into a massive bracket and forced to compete. The competition entered The Sweet 16 on Friday, and Lamb said the Top 8, Final Four and the Championship will be held next week. Sierra Barnhart, a sophomore and a victor in Friday’s competition, said she entered the competition after several teachers in her house, Prospect Hill, urged her to. Barnhart said she really enjoys math but considers herself pretty competitive and didn’t take chances during the contest. “I only do problems I know how to do,” Barnhart said after getting six out of six questions correct. Max Thomas, another sophomore and one of Friday’s victors, had an identical strategy and said it “felt good” to win his round of the competition. “It was pretty good and fun,” Thomas said. 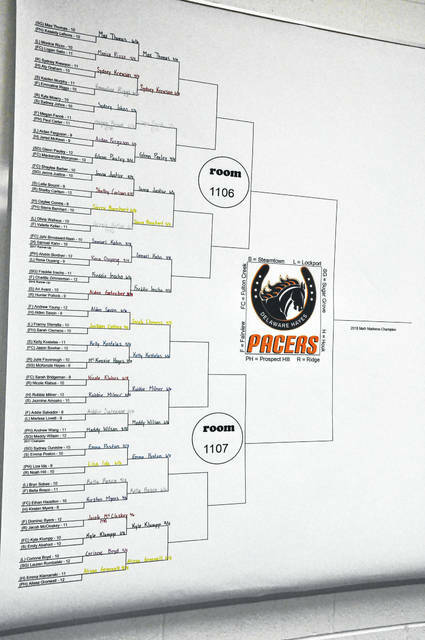 Adam Graham, another math teacher at Hayes, ran the other half of the Sweet 16 competition in his room. He said he looks forward to the competition every year. Graham said his favorite part is seeing his “cool and calm” students start competing with their hands shaking. “We’ll keep doing this every year,” Graham said Friday.